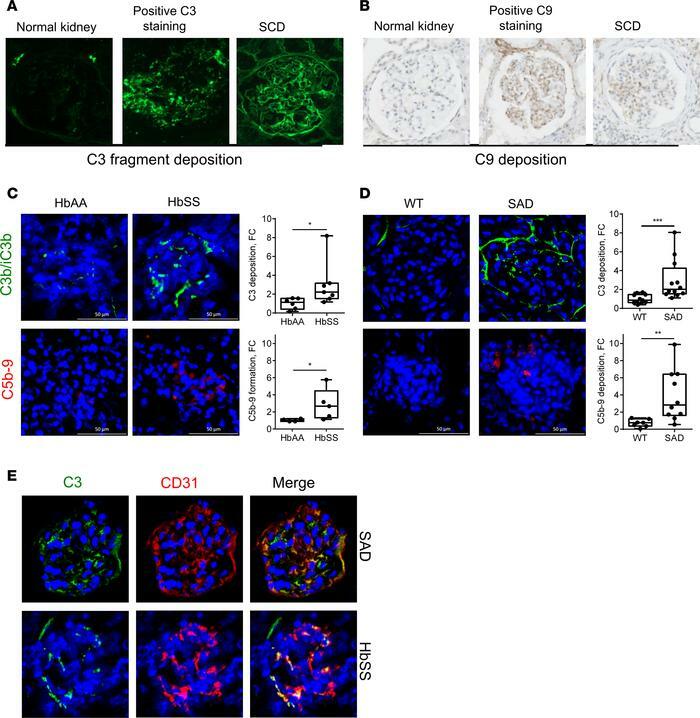 Patients suffering from SCD nephropathy and SCD mice have complement deposition within kidneys. (A) C3 fragment staining (false color green) and (B) C9 staining (brown) of kidney biopsies of patients with SCD nephropathy, performed by immunofluorescence of frozen tissue and immunohistochemistry of paraffin-embedded tissues, respectively. A normal protocol kidney allograft biopsy performed at 3 months was used as a negative control and a biopsy of a patient with acute humoral rejection was used as a positive control for the staining. (C) C3b/iC3b (false color green) and C5b-9 (false color red) staining of kidney sections of HbAA and HbSS mice. Quantification of the C3 and C5b-9 staining in HbSS (n ≥ 7 mice per group) and HbAA (n ≥ 4 mice per group) mouse kidney glomeruli. (D) C3b/iC3b (false color green) and C5b-9 (false color red) staining of kidney sections of SAD mice and WT littermates. Quantification of the C3 and C5b-9 staining in kidney glomeruli (n ≥ 7 mice per group). (E) Double staining of SAD and HbSS mouse kidney sections for C3b/iC3b (false color green) and endothelial marker CD31 (false color red). The merge image indicates colocalization in orange. One glomerulus was focused on. *P < 0.05; **P < 0.005; ***P < 0.001, Mann-Whitney test. Values are shown as box plots with median and minimum/maximum points. Scale bar: 50 μm. Original magnification, ×26.